Melt butter and marshmallows in a large pot on the stovetop, stirring often on low heat. Once melted, remove from heat and stir in popcorn. Once popcorn is coated evenly with marshmallow mixture, quickly stir in candy. The chocolate may melt a bit. 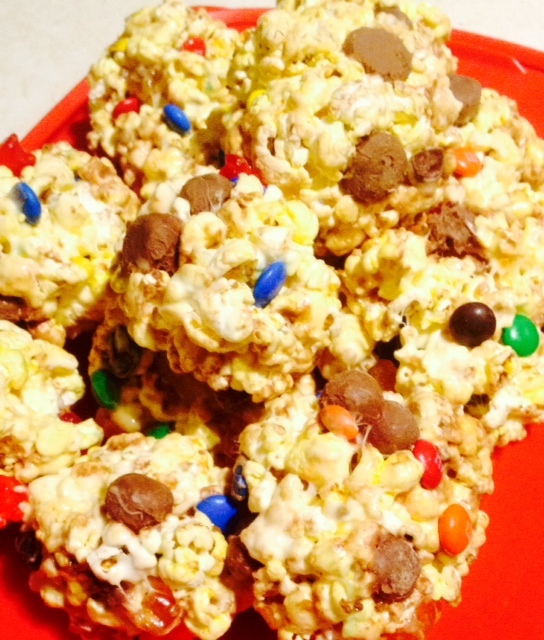 Form the popcorn balls about as large as your fist and cool on a nonstick surface (I used a silicone cutting board). Once cooled, store in an airtight container. You have to!! You will love them! !